Tufford, Adèle. "Maude Barlow". The Canadian Encyclopedia, 10 January 2019, Historica Canada. https://www.thecanadianencyclopedia.ca/en/article/maude-barlow. Accessed 22 April 2019. Maude Victoria Barlow (McGrath), advocate, activist, author (born 24 May 1947 in Toronto, ON). Maude Barlow is a co-founder and Honorary Chairperson of the Council of Canadians, one of Canada’s leading independent advocacy groups. She is an outspoken advocate and author on issues including democratic and social rights, trade sovereignty, and environmental justice. Barlow has served as a Senior Advisor on Water to the United Nations. She also serves on the World Future Council and on the board of Food and Water Watch. 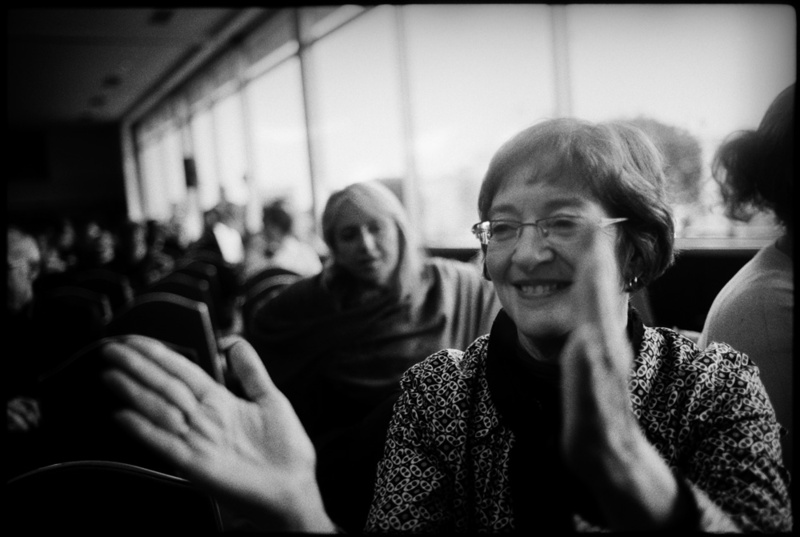 Canadian author and water activist Maude Barlow, applauds a speaker at the Peoples Water Forum in Istanbul, Turkey on 19 March 2009. Maude Victoria Barlow, born Maude Victoria McGrath, was born in Toronto, Ontario. Her family later settled in Ottawa, Ontario, where her father William McGrath was a social worker who advocated for prison reform and against capital and corporal punishment. She grew up with two sisters, Pat and Christie, who have described how from a young age Barlow would challenge their conservative grandfather’s views on social issues. Barlow attended Carleton University, earning a Bachelor of Arts in History in 1974. In the early 1970s, Maude Barlow discovered the works of prominent feminists such as Germaine Greer and Andrea Dworkin, and has cited their ideas as what “punched [her] in the face”. This awakening led to an early career as an advocate and consultant, serving as the Vice President of Women Associates Consulting. There, she was engaged in projects such as advising the CBC on affirmative action programs for women. She went on to act as the Director of Equal Opportunity for the City of Ottawa. In 1983, her work came to the attention of Prime Minister Pierre Trudeau, who appointed her Senior Advisor on Women’s Issues. In 1985, Barlow helped to found the Council of Canadians (CC) alongside Mel Hurtig, Pierre Berton, Margaret Atwood and other prominent Canadians. She was elected chairperson in 1988. Through this platform, she became an outspoken advocate for Canadian democracy and social programs. She has described Canada’s system of social programs including housing, health care, and education as “ribbons of interdependence”; when woven together they form a uniform collective of citizen’s social rights. The Council of Canadians has contributed to important policy changes in Canada, such as a moratorium on the use of Monsanto’s artificial Bovine Growth Hormone in Canada. In addition to causing a variety of negative health effects in cows, artificial Bovine Growth Hormone produces a by-product that may increase the risk of cancer in humans. Maude Barlow began advocating for and writing about environmental causes in the early 1990s. Her advocacy has included issues such as industrial pollution, pipeline projects, and Canada’s oil sands, which Barlow has described as “Canada’s Mordor,” a reference to the evil, blackened and poisonous realm in J.R.R. Tolkien’s Lord of the Rings. In addition to her role as honorary chairperson of the Council of Canadians, Barlow serves on the board of directors of Food and Water Watch, and on the executive committee of the Global Alliance for the Rights of Nature. Barlow’s fight for water conservation, rights, and accessibility has become one of her defining causes – she has often been referred to as a “water warrior”. Barlow has championed the idea of the “water Commons,” or the notion that water is a public trust that belongs to all species, which should not be subject to corporate ownership and privatization. In 2000, Barlow co-founded the Blue Planet Project, an organization that supports initiatives to protect water in both developed and developing nations. They work with local authorities, activists, and grassroots organizations to promote water as a human right. In 2008, Barlow was appointed Senior Advisor on Water to the United Nations (UN) General Assembly, where her work was instrumental in the UN’s 2010 resolution that water and sanitation are basic human rights. At home, Barlow has been critical of Canadian policy makers, as well as the public, for their complacency surrounding water management. In 2009, the CC worked with local First Nations and non-Indigenous groups to help defeat a secretive project (“Site 41”) for a landfill in Simcoe County, Ontario. The landfill would have contaminated pristine ground water in the area, including under land claimed by the Beausoleil First Nation and near other First Nations’ land. Barlow has also fought corporate takeover of Canadian freshwater resources, such as the campaign led against the Swiss food-giant Nestlé’s daily extraction of millions of litres of bottled water in Ontario and British Columbia. In Barlow’s 2016 book Boiling Point: Government Neglect, Corporate Abuse, and Canada’s Water Crisis, she outlines the threatened state of Canada’s fresh water supplies. Canada holds 20 per cent of the world’s fresh water, yet pollution, contamination, and drought are widespread, and are projected to worsen with climate change. In particular, the Great Lakes, which provide drinking water to about 40 million people, have seen a substantial loss of native aquatic life, the arrival of many invasive species, pollution from industry and agricultural runoff, and dramatic fluctuations of water levels in recent decades. Throughout an advocacy career spanning over 40 years, Maude Barlow has authored or co-authored 18 books and contributed to dozens of reports. She has explored the state of the global water crisis in Blue Covenant (2007) and Blue Future (2013). She has also written about the role of activism in Global Showdown: How the New Activists are Fighting Global Corporate Rule (2001), co-authored with Tony Clarke, and in her autobiography, The Fight of My Life: Confessions of an Unrepentant Canadian (1998). Barlow is featured in the award-winning 2008 documentary Blue Gold: World Water Wars, based on her and Tony Clarke’s book, Blue Gold: The Battle Against Corporate Theft of the World’s Water (2002). She is also the subject of a 1998 documentary produced by the National Film Board of Canada, Democracy à la Maude. Do not listen to those who say there is nothing you can do to the very real and large social and environmental issues of our time ... A life of activism gives hope, which is a moral imperative in this work and in this world … you help transform ideas and systems, and you commit to leaving the earth in at least as whole a condition as you inherited it. Maude has two sons, Charles and William Barlow, with her first husband Garnet Barlow. She lives in Ottawa with her husband, lawyer Andrew Davis. Maude Barlow has received multiple honorary doctorates and international awards, including the prestigious Right Livelihood Award in 2005, often referred to as the “Alternative Nobel”. Frequent think pieces by Barlow on topics such as global trade agreements, the water commons, and Canadian politics and democratic issues. What is the Blue Planet Project? Maude Barlow explains the Blue Planet Project and fundamental water rights to Big Think. Watch the 1998 National Film Board of Canada documentary about Maude Barlow’s life and early work with the Council of Canadians. Maude Barlow explains the role of the Council of Canadians.